Yesterday the first steps for editing were explained. Voices were synchronized and extracted according to their usefulness. 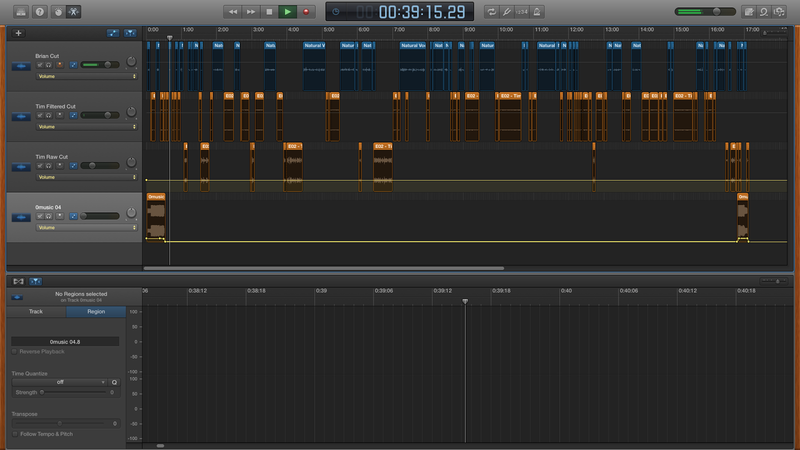 This is a rather boring phase of editing and time consuming but it’s not particularly difficult with modern software. If this were done with physical tape, like it used to be, I would expect a salary. Now it can be done on a cell phone during a coffee break. The next step for editing 2 Cyborgs and a Microphone was to take the audio clips, which have a lot of blank space between then, and move them next to one another. Each track is kept separate so they must be moved in unison. Different effects can be applied to each track. My voice needs to be given an effect to make it seem warmer. Tim’s voice needs an effect to reduce background noise and reduce volume. Since we’re recording on different rigs it’s important to make them sound similar and some improvement is still necessary. In the first episode each voice came through both left and right stereo channels equally but they are being separated slightly so one voice is stronger on one side while the other person’s voice is stronger on the other side. At this point the show is pretty much ready for publication but some extra effects make it sound more professional. Intro and outro music was added. This music is public domain music so no royalties need to be paid and it’s generated by AI so it’s particularly relevant to our podcast. Plus it sounds pretty innocuous so it fits well. After all the timeline editing is done, and the effects are applied and music is added the whole stream looks like a convoluted mess. And it is. This mess is compiled and written to an mp3 which is shared on this page. Videos get made with the TC+ logo and our email addresses as the only visual but the audio is identical. Youtube is a good distribution platform. Hopefully more ways to distribute will be found. If anyone has experience with podcasting and wants to share their secrets please give me an email or comment.